I made a same bento for yesterday and today because the kids were asking for the same Lap Chong Fried Rice. Still in pain on my back leave me no choice except to prepare this quick and easy lunch for the kids. I only managed to make Kiiroitori because was easy to make. I think this time I should be forgiven for not being able to complete the main character which is Rilakkuma. But wait! Can that lid of the Rilakkuma bento box count? Today will be the last day for San-X characters theme. For next week, I will have to figure out some ideas for Debra's B.O.M.B challenge on Hapa Bento. Everyone can participate, just read her blog regarding this. RILAKKUMA is a brown bear that usually accompanied by white bear called Korilakkuma and the yellow chick called Kiiroitori. Inside the box : lap chong (chinese pork sausage) fried rice, quail egg, edamame, slices of cucumber & roma tomato, and egg for decorations. Ohh, Lia, even when you aren't feeling well you still manage the cutest bento ever! So sorry to have to endure pain, but it's Friday so hopefully you can rest up over the weekend! Love love love Rilakkuma and friends, and little Kiiroitori is so perfectly made, as to be expected from you. 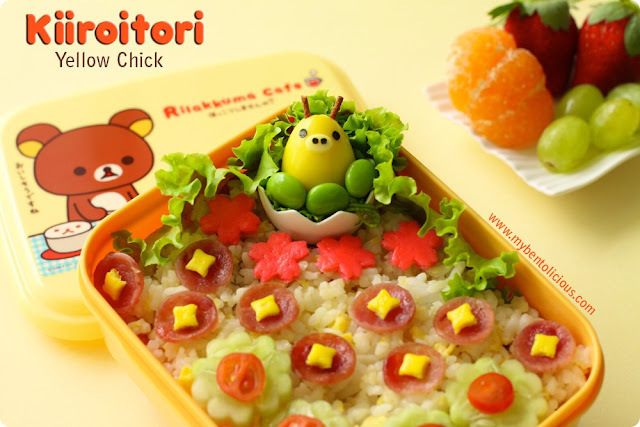 If you had put them both in this bento it would have exploded with cuteness so this is much better :) Super adorable bento and like your kids I would love to eat this fried rice every day too! Take care Lia! So tiny and cute! We call Chinese pork sausage "lup chong". I wonder if it's the same? @hapabento : Thanks a lot Debra! It was me got it wrong. Chinese sausage should be lap chong / lup chong not yang chow hehehe ... I guess I just got mixed up with Hakkanese. We often said it yang chow for Chinese sausage :) I edited the text. hope u feel better soon. sonny loves lap cheong too - its the Asian bacon!! Love the way you present your bento... looks like a book cover! Hey Lia :) I liked seeing the lids in your last two pictures. The lids are as much fun to me as what is inside! @Angeleyes : Thanks a lot for your sweet comment! Take more rest Lia and hope you'll feel better soon. This is bento is very pretty. Take care Lia and have a good rest. @Anncoo : Thanks a lot Ann! I will have a good rest ;) Have a nice weekend Ann! Bento is looks simple but its not.You're the best mummy.Pls take good rest and hope u can get well soon. Hoping you'll feel better, dear and thank you for all the big smiles you've created with this adorable bento! You're a great mom, and your kids are lucky! If I feel unwell, I will not be able to make anything. Also today's bento is really cute and yummy. Hope you regain your perfect condition quickly. @凶妈妈 : Thanks a lot 凶妈妈! Your comment cheer me up, hope next week the pain will gone ;) Have a nice weekend! I love the yellow one, kiiroitori (antene-nya lucu). Btw, yang bunga merah itu apa ya mbak? @The Bargowo : Thanks a lot Menoq! hahaha antena anti petir nih ... :D Merah bunga itu telur dadar warna. I once worked with a Japanese coworker who told me about bento lunches and how her mom would wake up really early to make her these beautiful bento. Then I only heard and never saw but now that I see your bentos, wow, they are such an artwork! You have such a creative mind!